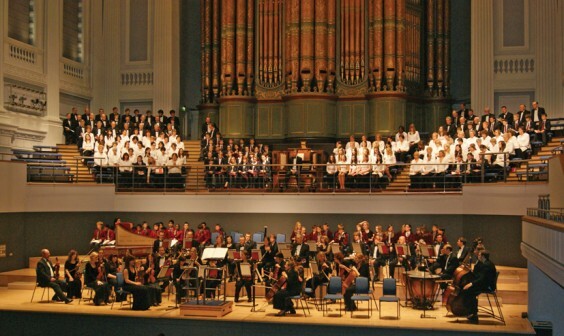 The Choral Society of Bromsgrove School last month took to the stage in the magnificent surroundings of Birmingham Town Hall. Comprising current pupils, Old Bromsgrovians, parents and past parents of the school, members of staff and Governors, as well as friends of the above and augmented by West House and Winterfold Prep School pupils, the Choral Society performed Haydn’s masterpiece, The Creation. Director of Music Jonathan Kingston conducted a brilliant performance of this mightily uplifting work, with the Orchestra – many of them Bromsgrove School’s music teachers and pupils – and Assistant Director of Music Richard Knight playing the 6,000-pipe organ. Paul Bradley, plus visiting members of the music department Angela Kazimierczuk and William Coleman and Upper Sixth pupil Chloe Deval-Reed, were outstanding soloists and all forces closed the performance with a triumphant Sing the Lord, ye voices all.